Fry 150 gms Paneer till golden. Remove, add in the same oil fry 1/2 cup kajus and keep aside. Cool and grind into a paste. Boil 3 chopped tomatoes, 1" piece chopped ginger with 1 cup water, till tomatoes are soft. Cool and then puree. Soak 3 tsp watermelon seeds and 1 tsp khus khus for 1 min. Grind to paste. Heat 2 tbsp oil and add tomato puree and cook till oil separates. Add 1/2 tsp chilli powder and khus-khus paste and mix. Add 1/2 cup milk gradually, stirring constantly, and cook for 3-4 mins. Add 1/2 tsp garam masala and salt. Add enough hot water to get a thick gravy. Boil and then simmer for 10-12 mins. Add paneer and kaju. 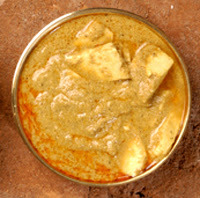 Boil once more, simmer for 5-mins till paneer is heated through the serve.